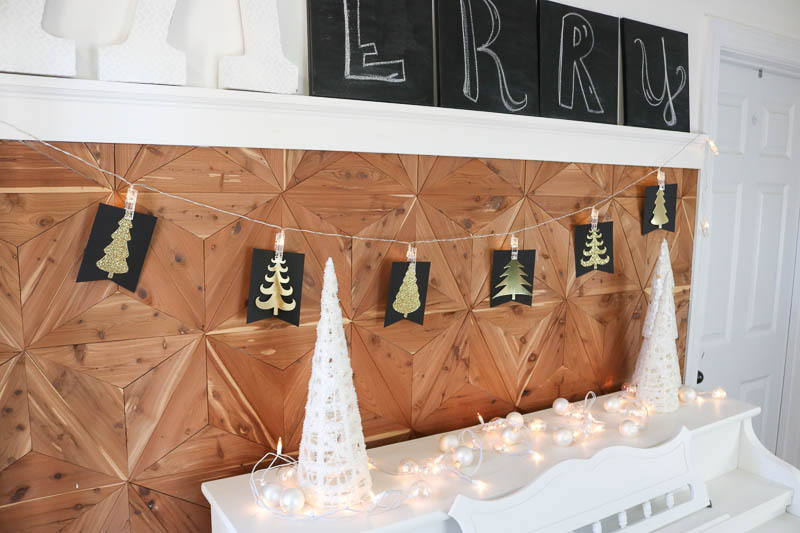 How fun is Christmas decorating? I have to say that the older I get, the more fun it is. That is unless I have to do it by myself. For the past few years, I let the boys slide and just did it all by my lonsome. This year, I cracked the whip and let’s say that a lot of whining was involved. Might have to rethink the whole “get everyone involved in the decorating” thing. It’s ok. 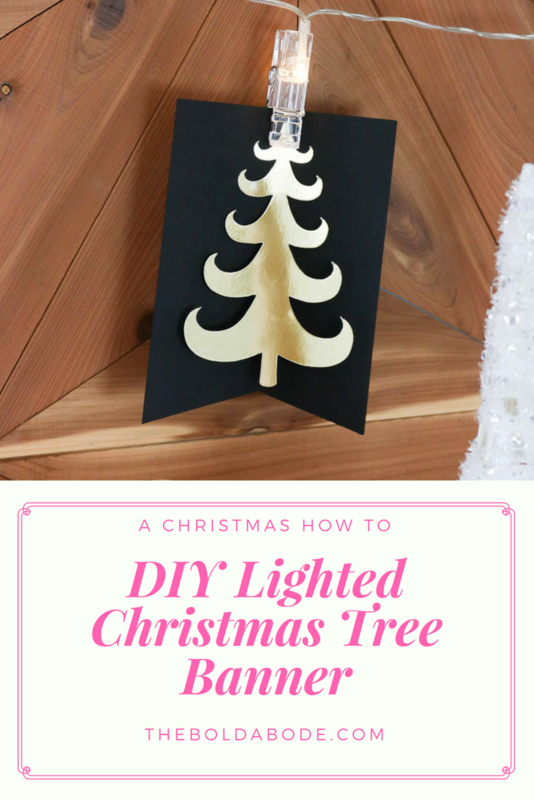 This Lighted Gold Christmas Tree Banner makes up for some of the pain! 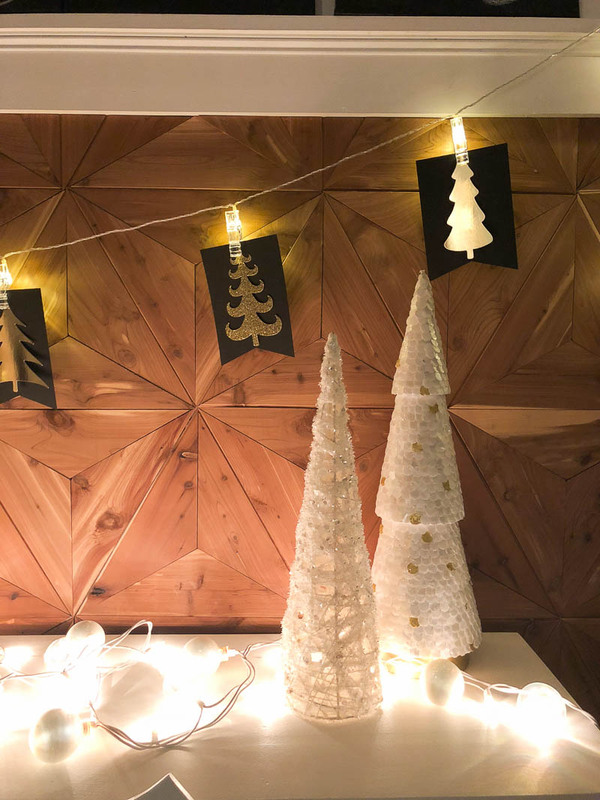 I don’t think I’ve ever made a Christmas banner. 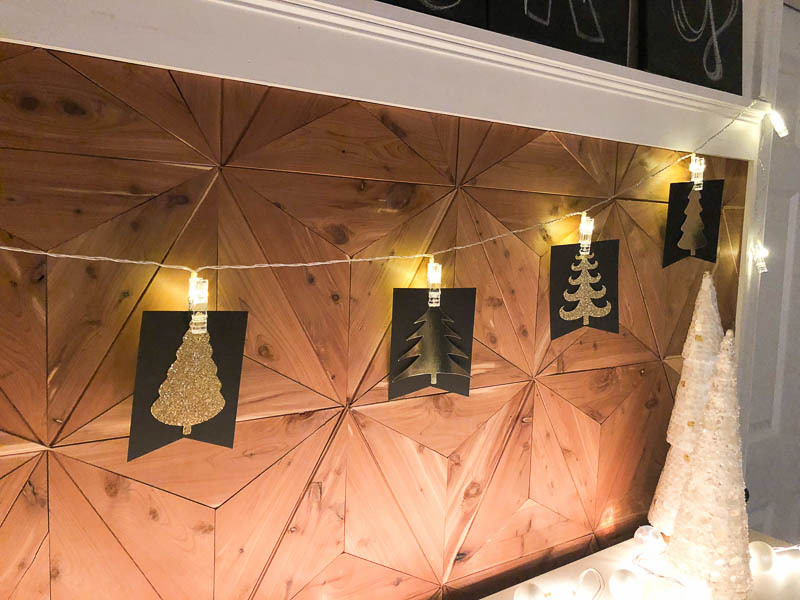 But I love decorating with paper. Not only is it simple and very pretty, it makes the investment in my Cricut worth it. I could never cut these paper decorations out if I didn’t have it. And ITS ON SALE RIGHT NOW! Holy cow. 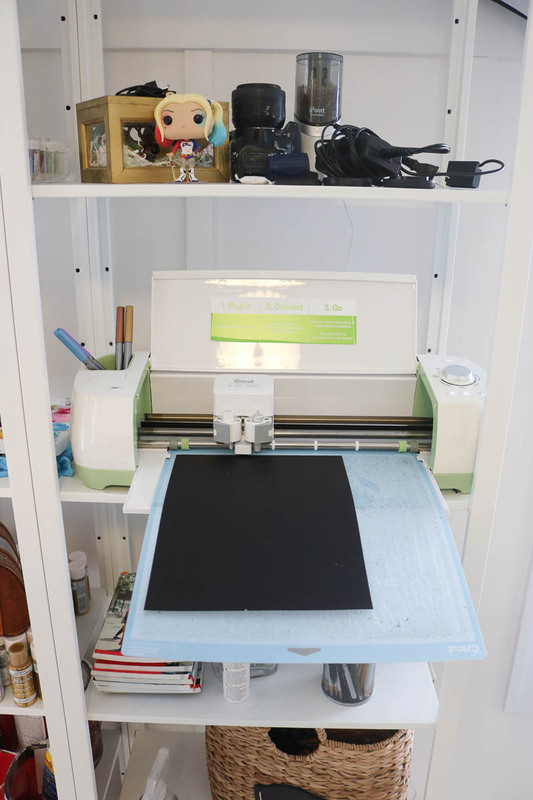 The Cricut Explroe Air 2 is $100 off right now! It’s usually $299, but when I just went to look, it’s only $199! Grab it now if you don’t have one! I have no idea how long the sale is going to last, so hurry, yo. Here’s Lucille cutting out the black paper fro the gold trees. It’s like magic! Gold Cardstock – this variety pack is awesome! This is so easy. Just cut out a variety of the Christmas trees. I made 8 but there are actually 10 clips. My space was just too small to use all of them. Then cut out the background banners in black (or whatever color you prefer). 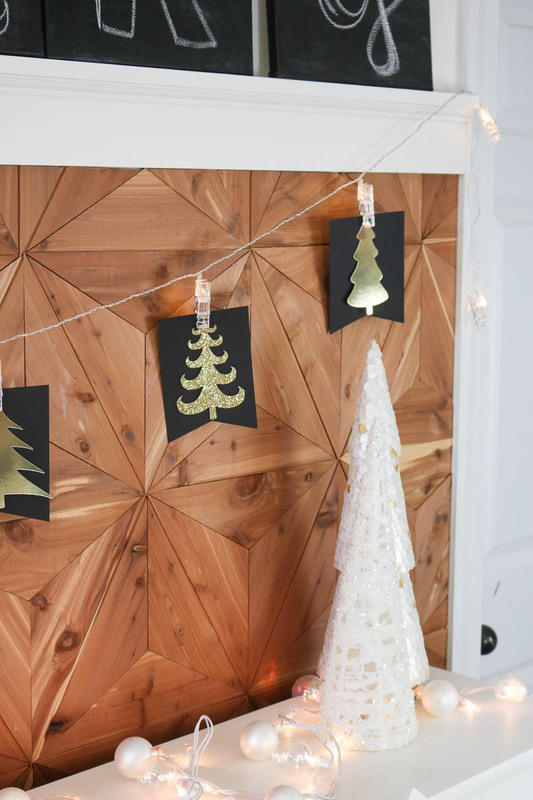 Then clip the banner and tree onto the string lights. That’s it! So easy. 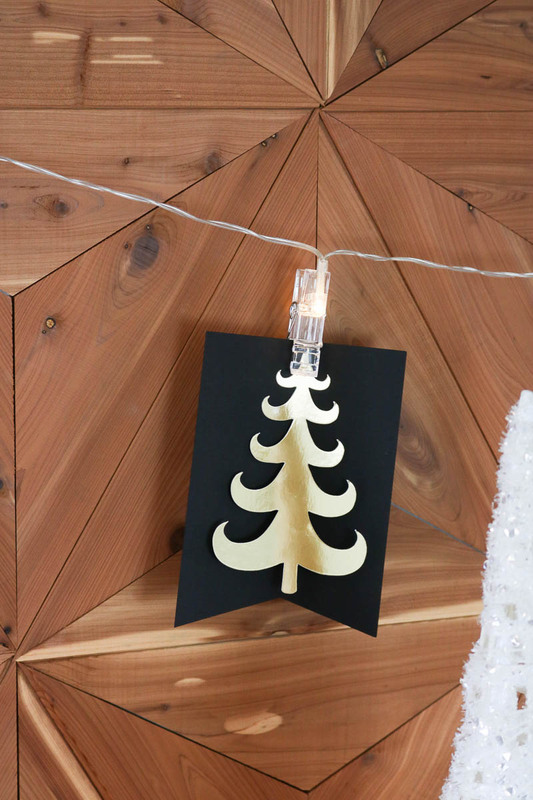 I didn’t even glue the trees on the black paper. You can if you want, but they’re staying and I’m cool with that! 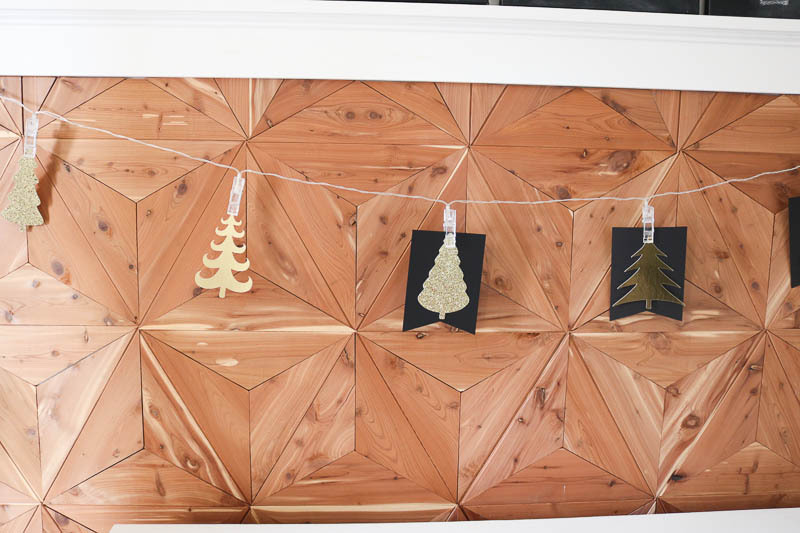 I hung them over my piano on the Geometric Cedar Planked Wall. 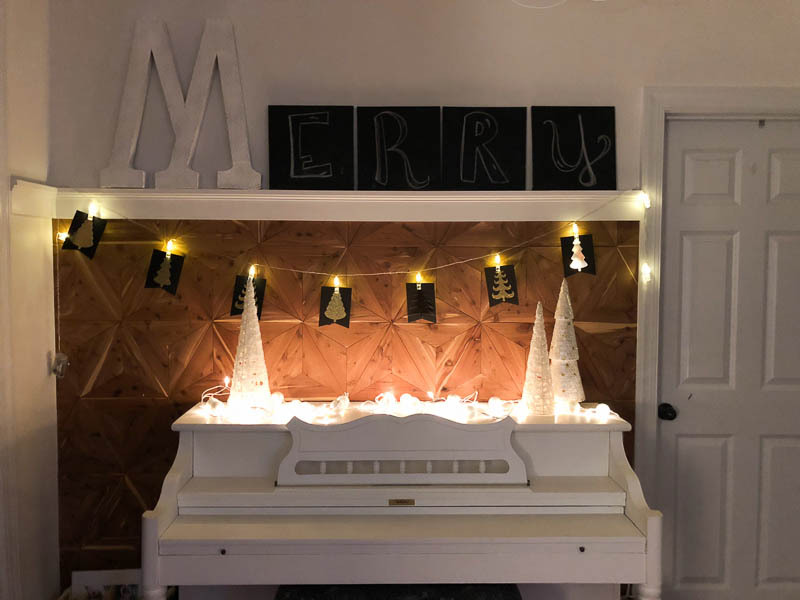 I added some simple white trees I bought last year and finished the piano off with a string of DIY Ornament String Lights that I made last year. These are super easy too! 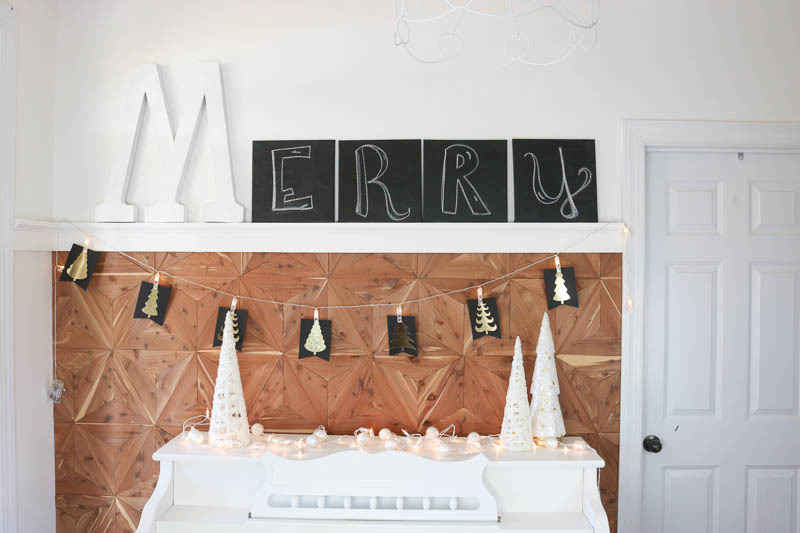 Above the piano, I used what I had to spell out “Merry”. The big ‘M’ is really a ‘W’ but I just flipped it upside down and wrote the rest of the letters on my DIY Chalkboard Canvases. And here are some photos at night! I am pretty happy with how it turned out. I mean, the more lights you can have, the merrier the season is, right? Unless you’re the Griswolds. Then all bets are off!